Every now and again, it’s a nice change of pace to see the Smiths united in their repulsiveness instead of dividing the family. Too often Stan is separated out as the antagonist and aggressor, alienating his family with his domineering persona. But in “Max Jets” they can all come together for greed, entitlement, and hating Roger’s fiancée. It starts at a surrogate for Outback Steakhouse, where Stan complains that he’s the only one earning money—and at a low-paying government job—and fiercely demands a cheapskate attitude. But Roger knows just how to save them: Max Jets, Roger’s about-to-be-released-from-prison and filthy rich persona. He sneaks back into his cell via a Shawshank Redemption reference, slips quietly into bed, and gets released with the praise that he’s been the perfect prisoner, sleeping for his entire sentence. At least Klaus has the sense to point out that it’s Roger. Everyone else knows, but having to establish that point makes it funnier. The Smiths know Roger is faking this character, they don’t ask where his fortune came from or anything about the logic; they just accept the gifts because they desire a high standard of living that apparently isn’t commensurate of what Stan earns. That’s some unrealistic episodic invention, but for a haughty and seemingly oblivious persona like Max Jets it’s worth it. At first the Smith’s love Max Jets, since he can shower them in lavish gifts and treat them to an extravagant meal—albeit at the same knock-off steakhouse. But he falls for their waitress Gina (voiced by Michelle Monaghan), and transfers his sugar daddy doting to her, which angers the Smiths, who believe they should be the only recipients of Roger’s nonsensical wealth while in character. In order to take down Gina, first the family tries to paint Gina as a gold digger, and she’s dropping some heavy hints. She vomits whenever she kisses Max Jets, goads him into building her a recording studio in the basement, where she records a terrible song about not being attracted to older men unless they have money to buy her things. During a beach outing, she flirts with younger guys, and the Smiths finally have Roger out of her clutches—until he chooses to propose in order to lock her down. That’s when the Smiths’ general frustration turns to all-out murderous rage. They decide to kill Roger before he’s married so they still inherit all of his money. The scene of the various family members failing to kill Roger but taking each other out is the best in the episode—especially Stan’s weakness for soup. But the Roger drama setup isn’t quite finished. The Smiths can’t prevent the marriage, but Max Jets dies from a poisoned piece of wedding cake, and the Smiths viciously celebrate their assumed inheritance. Except Max Jets leaves everything to his son Jerry Jets, another one of Roger’s disguises, who’s been having an affair with Gina because of course she’s attracted to the younger guy. It’s only the age that repulses her. The ending, when Roger returns to the steakhouse and explains that Gina killed Jerry Jets as well, reaches a bit too far. Everyone acknowledges the logical inconsistency of Roger dying by poison, getting killed again in a different disguise by Gina, then just popping up as the Smiths console themselves at the knock-off steakhouse. Sure, it’s an alien on a surreal animated show disguising himself constantly to blend in, but the point of this ending seems to be “it doesn’t add up, so let’s make it the last joke.” It’s a slight creative disappointment, as the show has wriggled itself out of tighter corners. 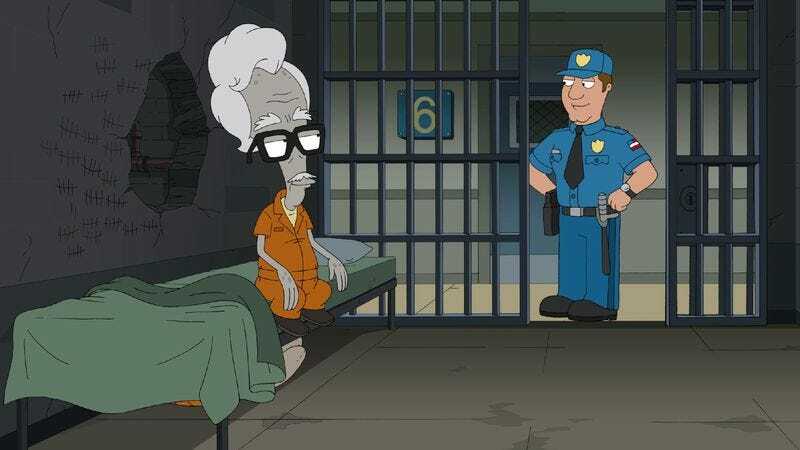 Episodes of American Dad that focus on a Roger disguise don’t frequently impress me. I’ve grown tired of the constant rotation and invention of a new character for Roger to be. But I do like when Roger’s disguise isn’t separated on its own, and this week it includes the entire Smith family in a way that brings out their dark side. For a fairly average episode plot-wise, “Max Jets” sure had a lot of funny and quotable lines.